This is our 17 month-old granddaughter, Madison. As a matter of fact she just turned 17 months old this past week. I think I usually stop counting the months once the grand-kids turn two, but before that two-year old marker each month seems to include some sort of wonderful milestone. Most of Madison’s milestones these days involve words. Words she hears that she immediately repeats. Our little family myna bird. These pictures speak for themselves, such sweetness and innocence. The funny thing about Madison is sometimes she puts on such a serious face when she’s looking at the pages of a book you just have to sit back and smile. 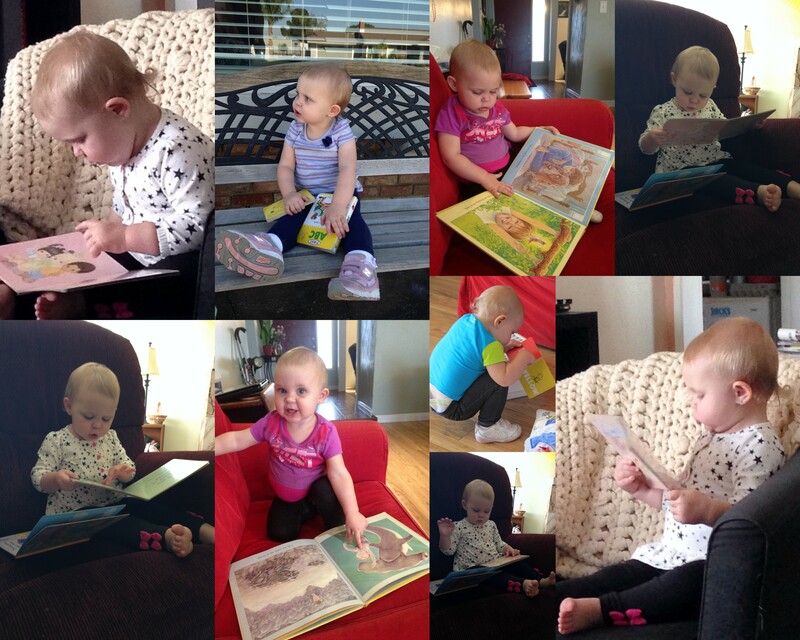 Madison is fast becoming a little book-worm. She loves to look at her picture books, or have them read to her. Sometimes she only listens to one or two pages, or I should say sentences and then wanders away. But she always comes back a little bit later to have the book read to her in its entirety. I cannot remember any of my kids being so attached to books at such a young age. It was always more of a struggle to try to figure out what would keep the kids’ interests to keep them reading. I did always tell my kids one of my famous Mom phrases (well famous to me), “Reading is knowledge, and knowledge is power.” I’m not sure if it really stuck with any of them, but it sure felt good for having said something so inspiring to them. Now that she’s a few months older, once in a while Maddy will pretend she is reading her book to you, and jibber-jabber along through the pictures while turning the pages. Her Nana (my Mom) and I applaud her efforts each and every time, and hope that her interest in books and reading will continue to grow and blossom with her for a long, long time. This post linked to the GRAND Social blogging event at Grandma’s Briefs. This entry was posted in Grandkiddies and tagged a love of reading, books, children's books, reading, young readers. Bookmark the permalink.